It doesn’t matter what kind of get together, great healthy food makes all of the difference. 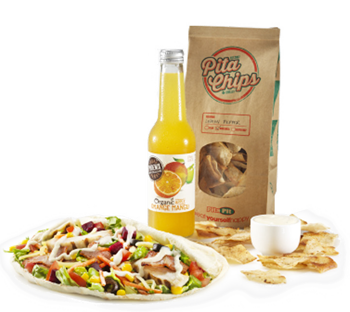 At Pita Pit, we cater for all venues, all ages, and all kinds of occasions. Our platters consist of a selection of pitas cut in halves, so each person in your group can have a chance to try more than one kind of pita. Drop us a line, visit in-store, pre-order through the website or mobile app and let us know how many people you require catering for. Choose from one of our pre-designed signature catering platters or customize your own. Our pre-designed selection of favourite pitas from the menu – the perfect way to cater for a group and try them all! Let us make it easy for you to eat yourself happy. More choices than a farmers market – our pre-designed selection of our favourite meat-free pitas. Includes the iconic Pita Pit Falafel. Let us help cater your next kids party or sports events. Our pre-designed selection of pitas from the Pit Kids menu. Ask us about our kids party packs and Pita Pete mascot bookings. A customised platter for those who know exactly what they want in life, and what kind of pita. Fill in one of the easy order forms available or enquire within your local store. Duis mollis, est non commodo luc- tus, nisi erat porttitor ligula, eget lacinia odio sem nec elit. Donec sed odio dui. Duis mollis, est non commodo luc- tus, nisi erat porttitor ligula, eget lacinia odio sem nec elit. Donec sed odio dui.Duis mollis, est non commodo luc- tus, nisi erat porttitor ligula, eget lacinia odio sem nec elit. Donec sed odio dui.